GMC Motorhome Cable, park brake rear tandem. Golby brake cables are engineered for durability, reliability and easy installation. 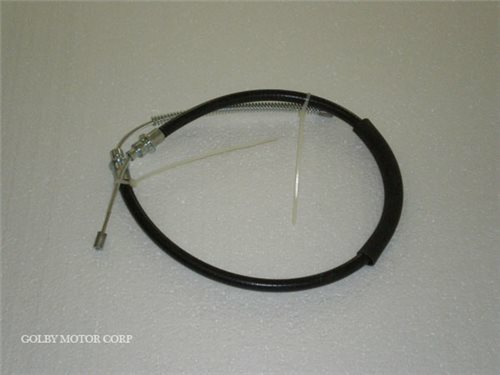 GMC Motorhome Cable, park brake rear tandem. Golby brake cables are engineered for durability, reliability and easy installation. Wire end fittings are machined to fit with other parking brake related parts. Weatherized housing end fittings snap firmly into backing plate assemblies. Manufactured to perform during long-term exposure in multiple environments. Cables coated in tough nylon casing that is wiped clean by integrated wipers built into the conduit end fittings. Conduit made of flexible steel wire enclosed in a polyethylene covering. Rubber bumpers and grommets added to protect casing from rub areas where casing makes contact with the vehicle's metal parts. We recommend replacing the cables at the wheels as a set due to the fact that they work so much smoother than the originals.